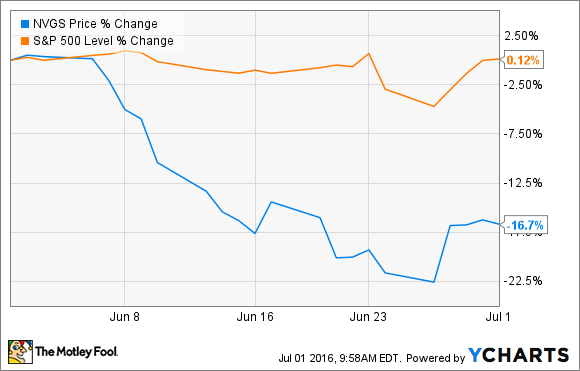 What: Shares of Navigator Holdings (NYSE:NVGS) declined 16.7% in June. The largest culprit for the decline is from the steep drop-off in gas shipping rates that have declined for much of 2016. So what: Unlocking shale gas in the US has had some wide reaching effects in so many industries. One in particular has been the transport of liquid petroleum gas -- also known as LPG -- like butane and propane. Prior to the shale gas revolution, the US was a major importer. Today, we're now one of the world's largest exporters. That sweeping change in LPG supply led to a lack of ships that could carry all those LPG cargoes, so companies started building out large fleets of these vessels. Problem is when there is a massive opportunity to profit, typically a few too many players try to take advantage of the situation. This is exactly what is happening in the LPG vessel market, and Navigator Holdings shares have been at the mercy of this change. Between August 2015 and today, 41 new Very Large Gas Carrier vessels were constructed. That surge in transport capacity has led to transport rates for LPG to decline to $25 per ton, the lowest in six years. To make matters worse, though, there are still another 117 vessels on order from shipbuilders. Unless there is a sharp increase in total LPG exports or some of these vessels are canceled, chances are shipping rates could decline even more. Now what: While this will likely make Navigator Holdings' life a little more difficult over the next few quarters, the company's balance sheet looks in good enough shape to weather a storm for a while. With a debt to capital ratio of 40.6% and a net debt to EBITDA ratio of 3.23 times, it's one of the better looking balance sheets among its shipping peers. Like anything commodity related, there are a lot of variables that could send Navigator's stock any which way over the next several quarters. LPG shipping is in the midst of a major growth spurt, and these times of rapid change can be difficult to sort out as an investor. So until we get an idea as to whether this oversupply of vessels on order is corrected quickly, then perhaps its best to hold off from using this downturn as a buying opportunity.